Rheinmetall Electronics GmbH produces complete simulation and training solutions for a wide range of critical naval operations. The company’s broad portfolio of naval training systems meet the highest demands in practicality and reliability while providing marine operators, commanders and technicians joint training in all key sections of a naval vessel. Rheinmetall’s cost-effective solutions provide marine customers with extensive training that uses role-specific and multi-role platforms, as well as a broad selection of sensor and effector systems for flexible mission tasking. The company’s naval mission training allows the industry to meet critical requirements for communications, damage control (DC) and crew resource management skills. Rheinmetall’s naval training collection includes ship handling systems that enable users to gain experience using vessel-specific battle tools such as the Warship Electronic Chart Display and Information System (WECDIS). The ship handling simulators feature control and display capabilities vital for carrying out challenging exercises. The requirements of standard naval training are exceeded through Rheinmetall’s advanced simulator technology, which replicates the effects of the interaction between the ship, environment and other vessels. The ship handing simulators imitate all applicable bridge systems, communications assets, and typical processes relating to RAS and SAR. They also incorporate current naval bridge components such as WECDIS with AMLs. Ship engine training forms part of Rheinmetall’s solutions and allows users to improve their naval skills through the use of PC-based trainers or full mission simulators. Engine simulators enable personnel to get to know and learn complex engine and utility system’s boundaries in a safe environment. Rheinmetall’s Naval Technical Equipment Simulation is an innovative system, which connects the original automation systems to the simulator. It replicates all major shipboard technical and utility systems, while it mathematically replicates all methods and parameters, as well as their constant system-dynamic calculations. The simulator also provides access to predefined and user-defined faults with probable access to all system variables. Rheinmetall provides computer-generated / live damage control simulators and safety and security trainers, which develop naval operators’ leadership and communications skills. The tools aim to prevent catastrophic outcomes through a unique training system that comprises ship simulation, fire modelling, smoke dissipation, and flooding set-ups. The damage control devices allow naval conflict preparation through simulated inspection and interaction, DC plotting tools, and communication systems. Rheinmetall also provides part-task simulators for operator training. The system allows users to become familiar with the capabilities and interaction of shipboard sensors, effectors and navigation systems. 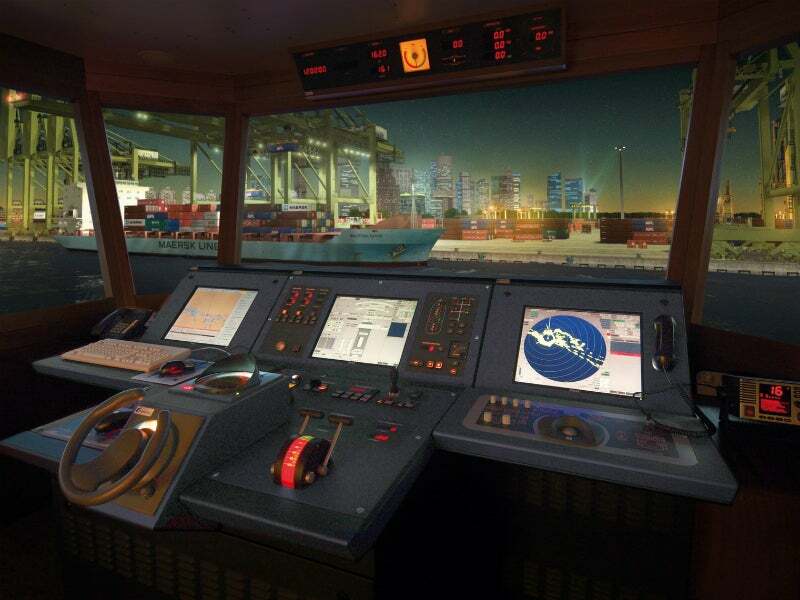 The shipboard system’s individual functions are simulated, while the high-fidelity simulations are available for several sensor systems, including sonar, radar, electro-optics, and navigation systems. Rheinmetall produces an Anti-Submarine Warfare (ASW) simulator designed to replicate challenging tactical situations under several operating conditions. The simulator allows the operator to recognise, classify and engage targets based on credible features such as sound beam progression, noise replication, and range. The ASW simulates several ship types using the same training resource. This is achievable due to three configurable consoles for different sonar and command systems. The simulator also features networking capabilities via standard interfaces with other simulators. The company also offers mine hunting simulators, which draw on longstanding know-how in sonar technology, command and control solutions, and mine hunting drones. The simulators offer very similar characteristics to the ASW, but they also provide several manufacturer configurations, which can be depicted using the same hardware installation. Rheinmetall supplies a Combat Information Centre (CIC) team trainer, which helps tackle the challenges of op centre tasks and the necessity to manage parallel activities. The trainer provides realistic operational training in an assembly of complex exercise situations. Its features include replication of specific customer systems, military data traffic at various networking levels, and preparation and post-processing of missions. Rheinmetall’s Naval Light Gun Sensor and Weapon Simulator provides detailed training in land weapon operators. The simulators link with other simulators through standardised interfaces, while they are reconfigurable for training at different workstations. The company offers action speed tactical training solutions, providing naval leaders with cutting-edge engagement tools. The products include several features that simulate lifelike tactical situations, including modelling platforms, sensors, and weapons, as well as underwater and surface topography. The company has created a Submarine Command Team Trainer (SCTT) that simulates configurable scenarios involving sonar, command and control, and weapon systems of various types. The SCTT also reconfigures consoles for the assignment of specific task and is scalable from operator training in individual systems to command team training for operational units. Rheinmetall’s Submarine Control Simulators (SCS) provide submarine warfare training equipment that features step-by-step development of undersea control through integrated customer-specific expansions, as well as complete simulation of all technical systems on-board and actual boat behaviour. Rheinmetall has developed the Total Ship Training concept to meet the important training requirements for the whole naval crew. The company’s idea of ‘customised training solutions’ means more than technical adjustment. It instead aims to solve customer issues and design a valuable training concept through the close exchange of information, knowledge and needs. The company’s flexible network architecture allows a modular expansion or replacement of simulators. It also offers interdependent scenario distribution, which marks the difference between team and crew training. Rheinmetall is the first company offering a solution that significantly reduces the use of operational resources for training purposes, as the whole crew can train together in the same real-world scenario, but ashore and without using the platform. Rheinmetall understands that navies and coast guards need their capacities to focus on maritime operations and have limited resources for ongoing transformation processes in a changing security environment. Total Ship Training is a pioneering training concept that facilitates the adoption of new training requirements by sharing large expertise with the customer. The company provides comprehensive support and accompanies clients with the implementation process. It takes care of follow-on maintenance and upgrade services, while it runs the whole turnkey training facility for the end-user. Rheinmetall will be presenting its wide range of naval products at the Eurosatory event from 11-15 June 2018. Rheinmetall manufactures bridge and navigation trainers for naval applications to deliver training beyond standard ship handling and navigational tasks. The effective use of modern combat systems requires well-trained specialists. It is increasingly challenging to prepare leaders for advanced operational scenarios in modern naval applications. Rheinmetall has longstanding expertise in the simulation of passive and active sonars, command systems and weapon systems such as torpedoes and missiles. Rheinmetall provides ship engine simulation solutions, which imitate the vessel’s propulsion and electrical systems, including its supply and support systems.